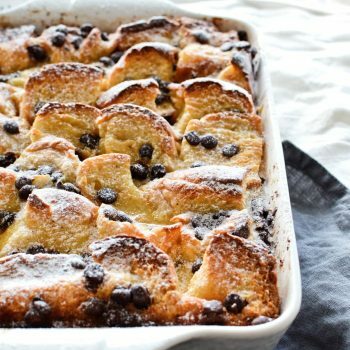 Easy to make, decadent bread pudding. Preheat oven to 180°C (356°F), with a rack placed in the center of the oven. Butter your baking dish and set aside. Slice bread into small chunks (about 5×2 cm or 2×1 inch in size – or smaller). Transfer them to a non-stick pan, set over low heat and toast bread until it’s golden and dried out. (Skip this step if you’re using older bread.) Transfer bread to baking dish and drizzle butter over the bread. Sprinkle with chocolate chips. In a medium bowl, whisk together milk, cream, sugar, salt and eggs. Then stir in orange juice and zest. Pour mixture over the bread and let it stand for 30 minutes (or overnight – in the fridge).Using a spoon, push down any piece of bread that is poking out of the liquid. Bake for 45 minutes or until it’s puffy, light brown in color and the custard has set. Check bread pudding every 15 minutes as it bakes. If you notice the bread is getting too dark too soon, loosely cover the top with aluminium foil and keep baking. I use an oblong baking dish to make this, approximate size is 18×22 cm or 7×9 inches. You can also use an 20-cm (8-inch) square pan or any similar size.